Our customers have vehicles or all shapes and sizes. 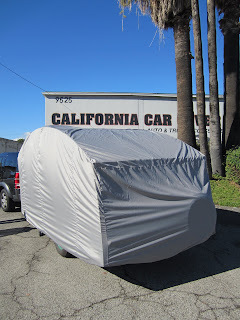 Not only does California Car Cover stock 100's of the top patterns, but we can also make a custom one-off cover for your car, truck, SUV or even trailer. Here are a few project we assisted local customers with lately. 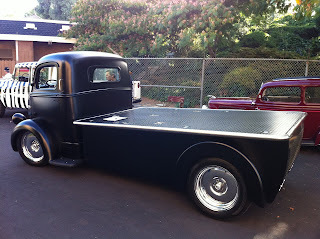 A local customer needed a custom cover to protect his vintage trailer this winter. A universal fit cover wouldn't cut it, so California Car Cover helped him measure and fit a cover so the fit and protection is optimal. The cover has the same double stitched seams and reinforced grommets found on all our customer covers. The trailer cover looks great and will protect its finish for years to come. Just don't use such a cover while towing. Another one of our customers in the bay area needed a custom cover for a hot rod pickup hauler. Because of the unique cab and bed, we have to create a custom pattern to make sure the cover fit right and did its job. For information on California Car Cover, please visit our website. Need assistance with a custom car cover? Give us a call at (800) 423-5525.